Busy as a Honey Bee: Yes, I stalk! Plus another LINK UP! OK, so with all these linky parties I sure have added to my blogger stalking! I thought i would share a few new blog finds that i am now following and enjoying so much! 1. Herding Kats in Kindergarten is a name that i can totally relate to! I honestly feel like I am herding wild animals on most days in my classroom! However this little blogger has definitely designed a cute site! I'm a new follower and am excited to read more about her little firsties! (She has now entered the world of first grade!) I also really like the western theme going on here! 2. From My Grey Desk is a cute fashion related blog that i found through Jami of Somewhat Domesticated! Jami has linked up a couple times and I did too! Call me a copy cat! Either way it was fun to share my high five for Friday and also I have gotten to see some neat little fashion ideas! 3. A Year of Slow Cooking is a spot i plan to come back to! This blog is going to be one of my new resources for my cute little crockie! I can't wait to find lots of yumminess! Really can't wait to try the 21-ingedient Chili Slow Cooker Recipe! It all looks so yummy! I've definitely got more to share but I am saving them for a later post... I'll tell you why tomorrow! But while i have your attention here's another link up! This time I am linking up with another blog that i am a new follower to! This time it's Kindergarten Lifestyle! This link up had me thinking up funny responses in the shower! The problem is that most of the time my answers could not be remembered! 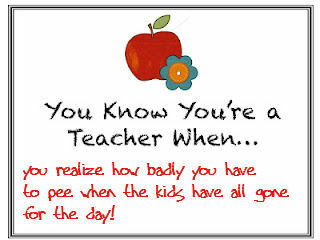 But here's one that i thought was pretty true.... at least for me and my neighbor teacher!